Bowls seem to be all the rage right now. Nourish bowls, Buddha bowls…you name it. They are everywhere. 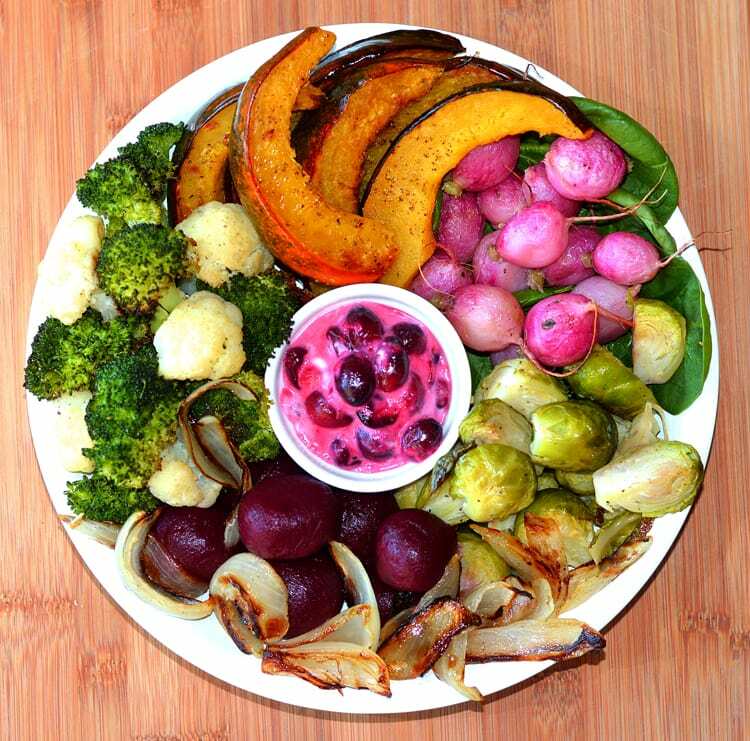 I don’t know that there is any set “recipe” for these bowls, but I happen to love all vegetable bowls like this Roasted Nourish Bowl. You could add some protein in the form of chickpeas, healthy fat like avocado and grains, such as barley or farro. 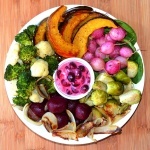 Today we used acorn squash, radishes, fresh spinach, broccoli, cauliflower, onions, beets and brussel sprouts. Take a look at the center of this bowl. I saw a similar recipe for this Cranberry Horseradish Cream and just had to try it! I am in love. Seriously, it was THAT good. Unexpectedly good. There is the sweet and sour from the cranberries, heat from the horseradish and the coolness of the vegan sour cream. You can adjust the horseradish to your personal taste. I know it sounds crazy, but trust me on this one. It’s definitely worth trying. So yummy!!! I roasted just about everything in its raw form tossed with a small amount of oil, salt and pepper. The only exception was that I par-cooked the radishes. You can always use canned beets if you can’t find fresh beets. Golden beets would be amazing in this dish as well. The vegetables used aren’t set in stone. Use what YOU enjoy eating. I do want to mention that I did cook these on two separate sheet pans with items that would cook in similar amounts of time. For instance, the broccoli will cook much more quickly than the squash. 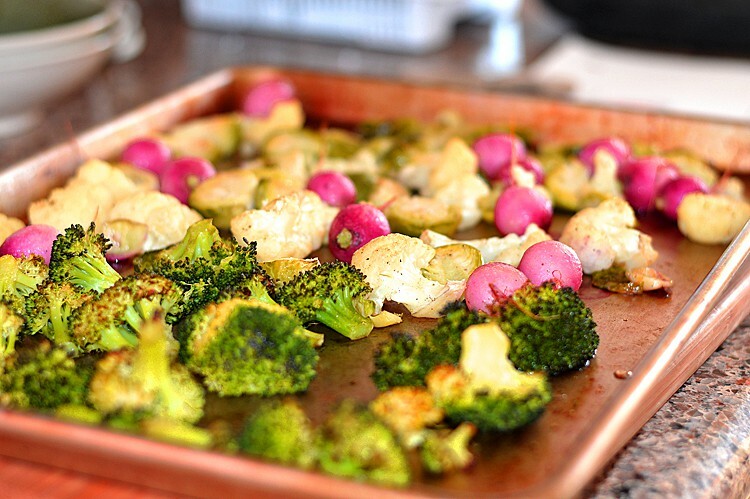 On two baking sheets, place all of the prepped veggies having already tossed them with oil. 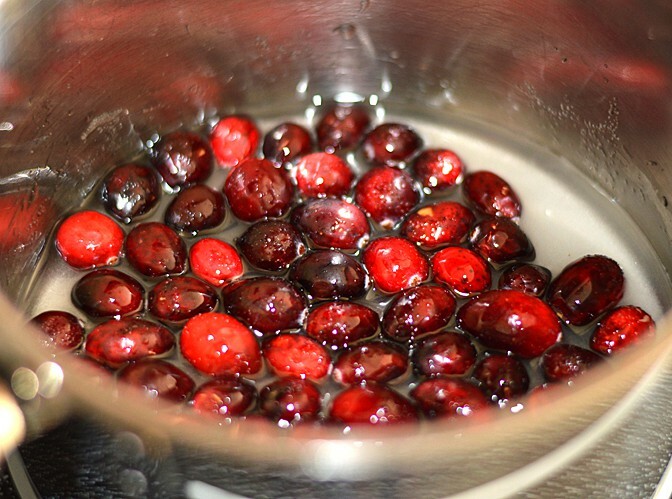 While they are roasting, place all but 1/4 C of the cranberries in a sauce pan. To that, add the sugar and water. Cook on low heat for 10 minutes. Raise the heat to medium and cook for another 10 minutes until they start to pop and burst. Add in the remaining whole cranberries. Cook for another few minutes. Allow to cool slightly. Fold the sour cream and horseradish into the warm, cooked cranberries. Place into a serving dish. Ideally, it would be best to refrigerate for a few hours but you could certainly serve it now. 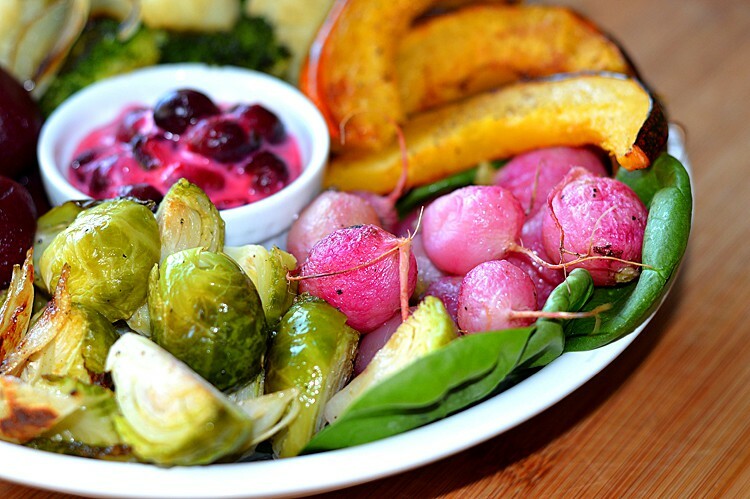 Remove the veggies from the oven and serve immediately.